In the last few months, I have taken a few opportunities to talk about deploying an application as a service. This is a subject with many aspects in connecting the concepts of cloud computing, application deployment process and IT operations. I find it also encompasses great frequently run routines for automation with Azure PowerShell. 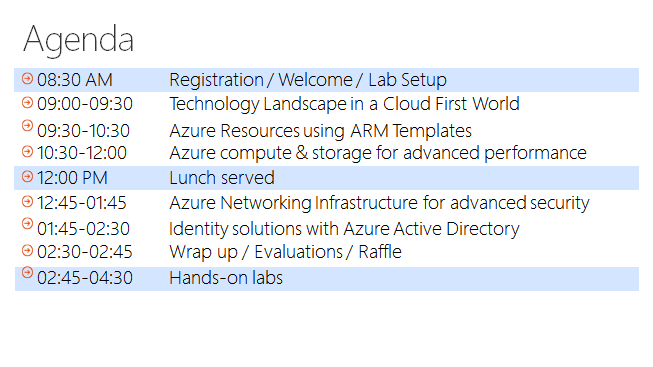 Here I share the material which I have integrated into IaaS workshops I have recently delivered. One noticeable difference of Azure Infrastructure Services (IaaS) V2 from Azure IaaS V1 (or classic Azure IaaS as I call it) is the employment of Azure “Resource Group” templates. A resource group not only is a newly introduced artifact in Azure, but denotes a fundamental shift on automating, deploying, and managing IT resources. This change signifies the arrival of a declarative programming/scripting model for the better. I will walk through an application deployment with Azure resource group templates in an upcoming post. In this memo, the focus is on distinguishing these two programming/scripting models. Traditionally, within a logical unit of work (or simply a transaction) the conventional wisdom is to define how to implement a business logic by programmatically referencing parameter values, verifying the dependencies, examining variables at runtime, and stepping through a predefined data flow accordingly. This is a so-called imperative programming model which uses assignments, conditions/branching and looping statements to serialize operations for establishing the state of a program at runtime, i.e. an instance. An imperative programming model is to describe virtually “how” to reach “what.” A vivid example is that C-family programming languages are based on an imperative model. An imperative model like the following pseudo code specifies the steps (i.e. how) to ensure the operability of attaching a database to a SQL server (in other words, what) by ensuring the SQL server is first up and running, i.e. ready, before attaching an intended database. The implementation logic is to repeated a routine of waiting for a specified period of time, checking the status of a target resource, until the target resource is ready for an intended operation. At the same time, a declarative programming model is to describe business logic based on ‘what it is and not how to do it.’ For instance, rather than programming a loop to periodically check the status of if a target SQL server is up and running like what an imperative model does as depicted by the above example, a declarative model will simply state the dependency on a target SQL server, i.e. what the state must meet, before attaching an intended database and let the system (here I use the system as an umbrella team of other components) to implement how to enforce this pre-requisite. The following illustrates a declarative approach. The above states the dependency, i.e. what it is, and delegates the implementations carried out later. Notice that an imperative model is to specify both the what and the how of a deployment. At the same time, a declarative model implies a logical separation and focuses on the what and leave the how later. In layman’s term, imperative vs. declarative is simply an approach of how vs. what, respectively. For simple operations, one may not be advantageous over the other. For large amount of operations or tasks with high concurrency and noticeable complexities, the orchestrations can be too overwhelming to productively implement with an imperative model. This is increasingly what IT pros are facing in a cloud setting where operations are intermittent, concurrent, and carried out on hundreds or thousands of various application instances with inter- and intra-dependencies among themselves at an application layer and a system level. A declarative model states what a target state is and the system will make it so, i.e. enforce it as stated. Employing an declarative model will fundamentally simplify how an administrator carries out application deployment and automation with increased consistency, persistency, and predictability. As IT is transitioning into cloud computing, the number of VMs will continue to increase while the deployment environment is likely becoming hybrid and complex, adopting a declarative programming model is, in my view, critical and inevitable. Essentially, IT has become such a highly integrated and increasingly complex environment, which is particularly true in an emerging IT model where cloud computing combined with hybrid deployment scenarios. Programmatically describing how to establish a state in runtime can quickly overwhelm programming logic and make an implementation based on imperative model very costly to develop and maintain. Shifting to a declarative programming model is strategic and becoming “imperative” for IT.